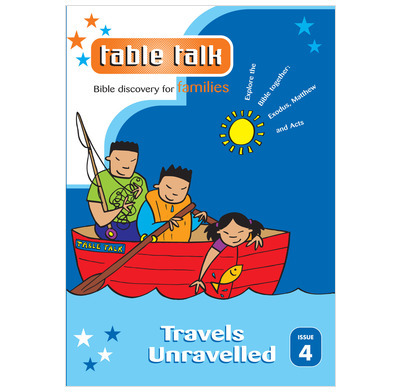 Issue Four of Table Talk is called Travels Unravelled. It contains three months of Bible readings based in the books of Exodus, Matthew and Acts and the pages are undated. It will help you to explore the very first Easter in Matthew's Gospel, wander through the wilderness with the Israelites in Exodus and join Paul as he travels to Rome in Acts. It dips into some of Paul's letters as well. Over days 11-15 there's a chance to look at some of the letters Paul wrote to the people he met in Acts. My children have thoroughly enjoyed the table talk series. We are now on book 4. They particularly like playing the games and at the weekend when there is more time sit making the posters suggested in the previous weeks notes. My 7 year old also does XTB which helps him to remember what we have learned. My husband and I have found that we too gain more bible knowledge from Alison's talks. It really doesn't take long to do and the sessions can be shortened (or lengthened) as your family needs.